Your skin is the largest external organ of the body. For every 1 inch of skin, you have about 19 million skin cells. Your skin is constantly growing, dying, and replacing itself. It provides a barrier to the cold and blockades germs and other foreign invaders from getting inside and making you sick. If you have diabetes, during the colder months it is especially important to take good care of your skin. Cold weather is hard on the skin and can be particularly troublesome for people who have diabetes. Monitoring blood sugars can become more difficult when the skin is cold, which can affect diabetes control. In addition, the cold can cause your skin to become dry and cracked. Cracks, openings in the skin, can allow for dirt and bacteria to enter, which can lead to infections. Because people with diabetes have immune systems that are compromised, they are more likely to get infections. Therefore, it's important to keep your skin protected, to prevent cracks and dryness. In addition, keeping your skin warm can allow you to continue to practice good diabetes self-care. Get started on protecting your skin by following a few important steps. You might feel cold, but try to resist the temptation to take a very hot shower. Hot water can actually dry out the skin. Dry skin is more prone to cracking and can make the skin irritated and itchy. Instead, use warm water. If you plan on taking a bath, make sure to test the water with your elbow, before stepping in with your feet, especially if you have nerve damage or poor circulation. You don't want to burn yourself. The cold weather can often be deceptive—it takes the body longer to warm up, but that doesn't mean you aren't losing water from sweating and urinating. To prevent dehydration, it's important to make sure you are drinking adequate amounts of unsweetened fluids. To ensure that you are, take a peek at your urine. If it is an apple cider color, you are dehydrated. Aim to have a clear yellow, lemonade color consistency. In addition, moisturize your skin regularly, especially after showering to lock in moisture. You can put cream on your feet and hands, but avoid putting it between your toes. Excess moisture between your toes or in the folds of the skin can be a breading ground for fungal infections. 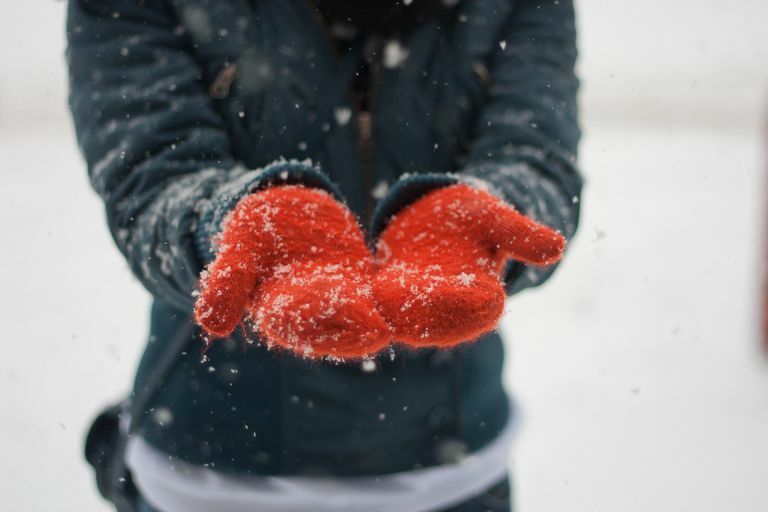 Testing your blood sugars can become more difficult in the winter months, especially when your hands are cold and dry. Avoid using alcohol to clean your skin. Alcohol can dry out your skin, which can make blood sugar testing more difficult. Washing your hands with warm water and soap can provide several benefits. It may warm your hands enough to increase your blood flow and it kills bacteria and germs, which can prevent illness, such as the flu. You can also rub your hands together to improve circulation. "Milk your finger" by pressing down from your hand toward the tip of your finger so that you can have an easier time at obtaining a blood sample. Wear well-fitting shoes and boots to prevent calluses or blisters that are prone to open and possibly cause an infection. If you are wearing thick socks to keep your feet warm, make sure that you are not squeezing into your shoes. If you don't already, consider seeing a podiatrist to assure you are wearing the proper footwear. Invest in warm gloves or mittens and breathable socks to prevent dry skin from the cold and wind. There is nothing more painful then red, cracked hands from exposure to cold. Keeping your hands warm can keep you motivated to keep your blood sugars in check and prevent cracks and cuts. If you have developed some dryness or cracks, it's important to keep your blood sugars at goal. If your blood sugars are elevated, cuts, wounds, and open sores are slower to heal. Keeping your blood sugars in target range can help to prevent infections. Slow healing wounds on the feet coupled with elevated blood sugars can be disastrous, sometimes leading to serious conditions, such as gangrene and amputations. Tsai A. Diabetes Forecast. Winter Skin Guide. September/October 2016, p28-30.